The religious life is always one that is devoted to God, but for those who choose the monastic tradition, it is a life of seclusion. Keeping to themselves is hardly a problem at the remote monastery of Saint Mina Al-Agaiby (the miraculous), on the east bank of the Nile near Assiut, in Upper Egypt, where even the locals cannot give you directions. 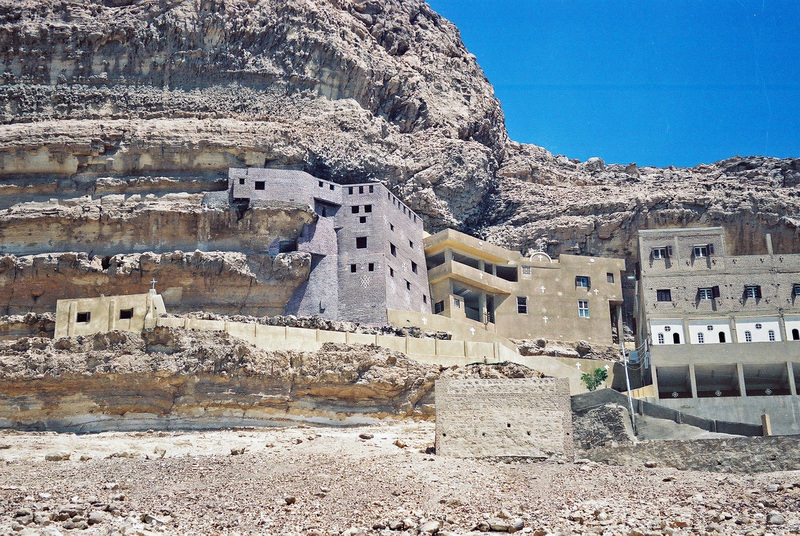 You probably heard of the hanging church in Cairo, but have you heard of the suspended monastery? Better known as Deir El-Mualaq (literally, the suspended monastery), the monastery is nestled high up between two massive rocks in the mountain of Abu Foda, roughly 170 metres above ground level. When we reached the foot of the mountain and I looked up at the monastery virtually hanging in the rock face, I thought for sure we would never reach it. The steep road that leads up to the monastery was not for cars that are weak at heart, and so, like the ancient pilgrims before us, we were forced to make the last part of our trek up to the monastery the old-fashioned way — on foot. Getting to Abu Foda is in itself a trek. 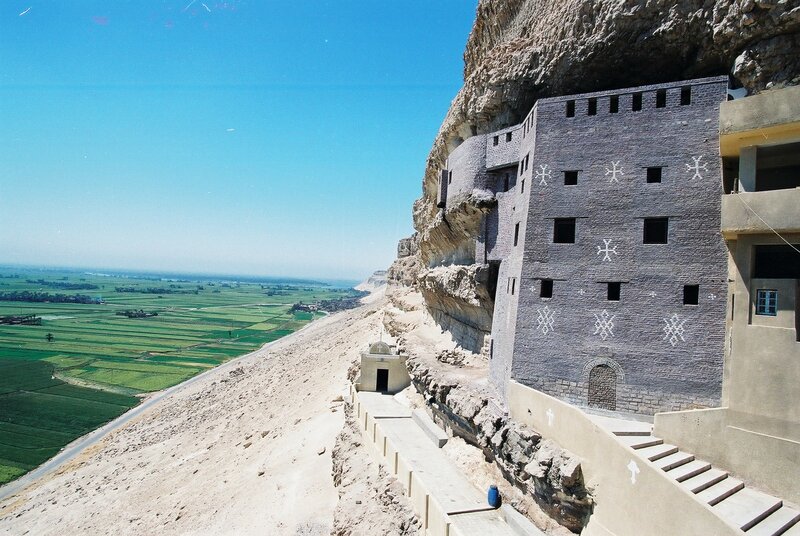 The village of El-Maabdna, which lies at the foot of the mountain, is situated on the outskirts of the city of Abnoub, roughly 35 kilometres northeast of Assiut. We had to cross the Nile by ferry and then hire a car to the monastery. Making your way across the Nile in this part of Upper Egypt is a mini-vacation through Egypt’s natural elements: the lush, green agricultural lands, the calm waters of the Nile and the desert beyond. But I’ll say it now: the trip is worth it. From the monastery the view is breathtaking, and the ascent up the stairway that leads to the monastery is one you will probably make alone. We spotted the ruins of a small village, believed to be a Coptic community from the fifth century A.D. while making our way up to the ancient keep (tower). Partly built of brick and partly rock-hewn, the keep is divided into three floors, the first mainly populated with cells for the monks. The second floor consists of three rooms used as a sacrificial hall in honour of the saint. The third floor leads to the top of the keep, where the two churches of the monastery are located, both carved into the rock. The Church of Saint Mina is a modest place of worship, built into an ancient cave. No rich rugs, icons or chandeliers here; its significance is its age and location. 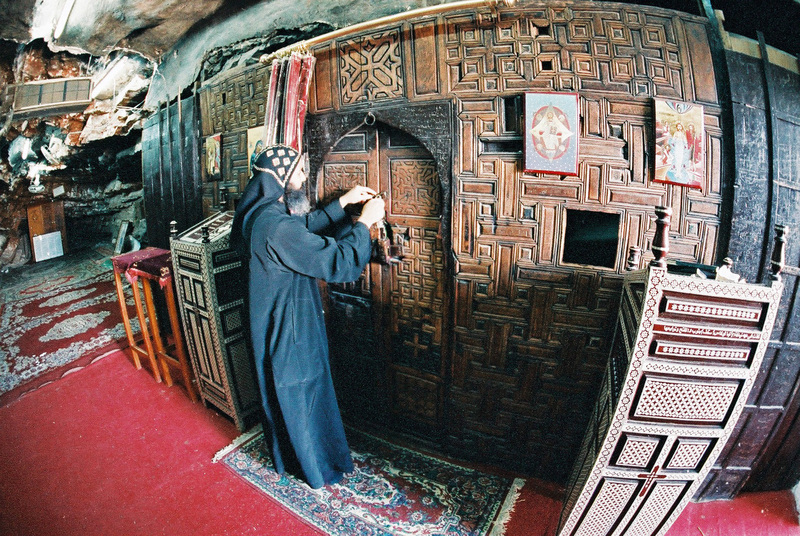 The wooden gate of the presbytery bears Coptic inscriptions like those on the gates of El-Suryani (the so-called Monastery of the Syrians) at Wadi Al-Natrun. One of the monks accompanying me explained that the Arabic and Coptic inscriptions on the gate were the names of people who had financed some restorations inside the monastery some 300 years ago. The monastery’s other church was converted from a Pharaonic temple. Today it is the Church of the Virgin Mary and Archangel Michael, but the ancient shrine is still evident in the Pharaonic inscriptions that remain. 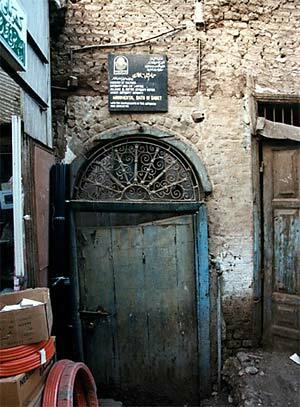 The wooden gate of the presbytery bears Coptic inscriptions like those on the gates of El-Suryani. The monastery itself has been renovated, with two new buildings constructed beside the ancient keep. One houses an icon of Saint Mina Al-Agaibi, the other is used as a storeroom for incense, candles, oil and flour for the sacred bread. New cells for monks were also set up, as well as a new receiving hall for visitors. I asked around to find out if the monastery had a steady flow of visitors, but it seems that it is mainly a place of pilgrimage for Egyptians, who tend to come in big numbers during the annual mulid, which takes place from 8 July to 8 August. Foreigners are few and far between. But it is obvious that one need not be a Copt to appreciate both the beauty and serenity of Deir El-Mualaq. I wondered whether the monastery could develop into a tourist destination — and whether the monks would in fact want to play host to backpackers and holy route tourists veering off their itinerary. For now, Deir El-Mualaq is best left as it is. 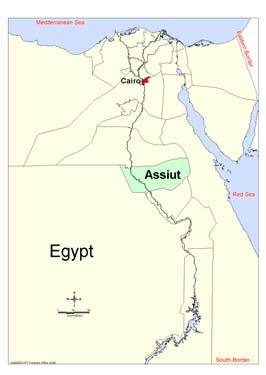 Once a major commercial and industrial centre in the Ottoman era, Assiut is known for its wikalas where merchants and traders used to assemble to sell their goods. Despite their historical importance, they are neglected. Well-known for its Pharaonic and Christian monuments, Assiut is still more in the business of daily living than shuttling tourists from site to site. A relaxing and picturesque city, it is nonetheless heavily populated and hardly accustomed to catering to the needs and expectations of the foreign traveller. But as someone familiar with this generally undervisited city, I have always appreciated my visits as an opportunity to explore the area’s lesser-known spots. 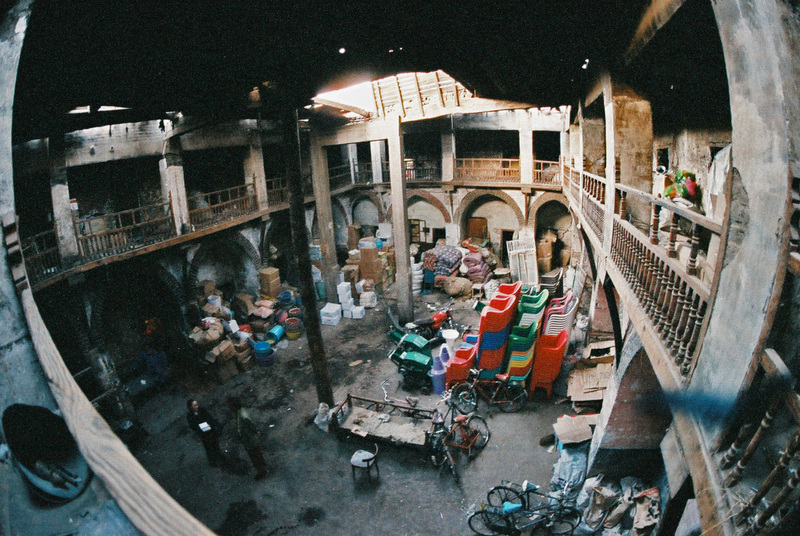 One of the wekalas in the old market of Assiut. Not that I didn’t trust my friend Adel, but I wasn’t so sure. So when he started to tell me how the wikalas — old commercial centres housed in large buildings — in Assiut were comparable to the vibrant trading centres we have in Cairo, like Wikalat Al-Ghuri and Wikalat Al-Balah, I got interested. What he didn’t tell me was that the communal trading of Assiut’s old wikalas is alive and well: the wikalas, however, barely remain. The wikala has served many functions, both as public and private space, since its introduction in Egypt during the Fatimid era. Historically, however, wikalas were large buildings, usually two stories, where merchants and traders assembled in a large main hall to sell their goods. Off the main communal area were chambers used for storing the merchants’ goods and the upper floor functioned as something of an inn, providing rooms complete with kitchens and bathrooms for itinerant traders. Money raised from the wikala sometimes went toward an adjacent mosque — the builder or owner’s way of offering a community service. Wikalas continued to be a feature of urban society through to Ottoman times. Ready to take on the wikalas of Al-Qesariyya, I left my hotel in Assiut early in the morning, thinking it would be a straightforward journey westward. But like most big cities, Assiut’s streets were crowded with women and children buying the day’s household needs and people making their way to work. Students and school-children clogged the little road space that wasn’t blocked up with cars. I seemed to have hit the rush hour and it was hard going. Stuck in the car, I had a little time to contemplate Assiut as the major commercial and industrial centre it once was in the Ottoman era. A major stop on the Darb Al-Arbi’in road, which leads south, Assiut was also famous for its textile and oil industries. Merchants regularly passed through the city, either as a stopover or to replenish their supplies on their way to what is now Sudan. With this in mind, I had envisaged Assiut’s wikalas to be grand, stately halls, perhaps tarnished and worn down by time, but still carrying vestiges of their former prominence. When I finally reached Al-Qesariyya, what I found was a far cry from what I had imagined. I found myself in a large, bustling marketplace with rows of shops on both sides stocked with every item imaginable: food, clothes, spices, plastics, perfume, vegetables, fruit. I saw carpenters, upholsterers, blacksmiths and other craftsmen at work. The marketplace was colourful and buzzing with activity — but where were the wikalas? It didn’t take long to realise that the historic wikalas were not monuments to be visited and toured; they were simply crumbling buildings interspersed among the modern trading areas. Goods were displayed and stored alongside ahwas (coffee shops), where the merchants gathered, drinking, smoking and socialising. They may be historic Ottoman sites, but to the locals of west Assiut, they were nothing more than walls on which to lean. I was tempted to give up and go back to my hotel when I spotted a big billboard in the middle of the marketplace — a professional sign that looked like a tourist marker bearing the names of the wikalas and the so-called Bath of Sabet. I sought out the Bath of Sabet, only to find that it was closed. After asking around, I found a guard who told me that the site was being restored, but I found no evidence of this in its run-down entrance or the painfully neglected surroundings. Feeling somewhat discouraged, I decided to check the place out anyhow, and was allowed in. From the moment I entered, I saw immediately that the bath, comprised of several halls used for different stages of hot water and steam, was once quite beautiful. We passed through another domed hall into the central hall, its floor made of marble and dotted with a number of benches where people could rest after their bath and sauna. 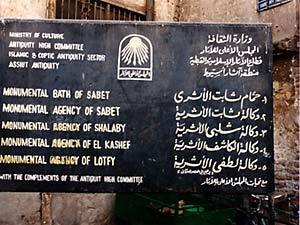 In one of the few books on Assiut I was able to lay my hands on, the Bath of Sabet is described as the only medieval public bath in Assiut and its neighbouring cities. Situated beside the mosque of Galaleddin El-Siyouti, its architecture is said to be unique. To me, the tourist potential was obvious, but whatever the previous efforts to take advantage of the site were, they have long since crumbled with the scaling walls. The monument is in sorrowful condition. The wikalas I found in Al-Qesariyya have hardly fared better. laWikalat Lutfi, whose western facade overlooks Al-Khan alley, was built in 1629 by Lutfi Abdel-Gawad, then one of Egypt’s important magnates. Lutfi turned the wikala into a waqf (charitable endowment), which would benefit the neighbouring mosque that bore his name. Wikalat Al-Kashef was built by Prince Mohamed Kashef Bekzada in 1821. Wikalat Sabet, situated alongside the mosque of Galaleddin El-Siyouti and overlooking Mohamed Mahmoud Pasha Street, was built by Mohamed Sabet in 1822. Down the street from Wikalat Sabet is Wikalat Shalabi, built two years later. In 1853, Wikalat Mohamed El-Hilali, a commanding 23-room structure built with rock and roofed with palm tree trunks, was established by Hagg Mohamed Farghali Abdel-Fatah El-Hilali. El-Hilali, then the head of the merchants guild, was said to have had good trade connections with Sudan. Moreover, he was also a relative of Omar Makram, who at the time was a prominent Egyptian leader under Mohamed Ali. Well, I had experienced this for myself. Upon entering one of the wikalas in Al-Qesariyya, I found a group of merchants occupying most of the building, with every corner and storage space crammed full of either goods or garbage. Here plastics, there cartons, in a far corner, metal tins. The second floor, once a comfortable hotel for traders, looked as though it was on the verge of collapse. But no sooner had I asked my accompanying photographer to take some photos of the interior than a guard materialised out of nowhere warning that pictures were “mamnu’a!” (forbidden). This, I was told, was because the site was “under restoration” — yet I noticed that this antiquities guard did not seem to think that merchants sitting around smoking shisha (waterpipe) and using the place as a private shop was a threat to the supposed restoration. Sometimes, the more you dig, the more you find that you might have been better off never knowing. I left Assiut with mixed feelings this time around, having discovered an area of the city comparable in historic relevance to many places in Old Cairo — but also saddened by the decrepit condition in which these sites remain. Forgotten by time and deemed, for the time being, unworthy of restoration, I realised that there was little hope for the wikalas of Assiut. And though I have always enjoyed this city, I worry about what other assets the city may hold, buried in neglect.